Grilled Peach Goat Cheese Salad with Candied Almonds - What the Forks for Dinner? 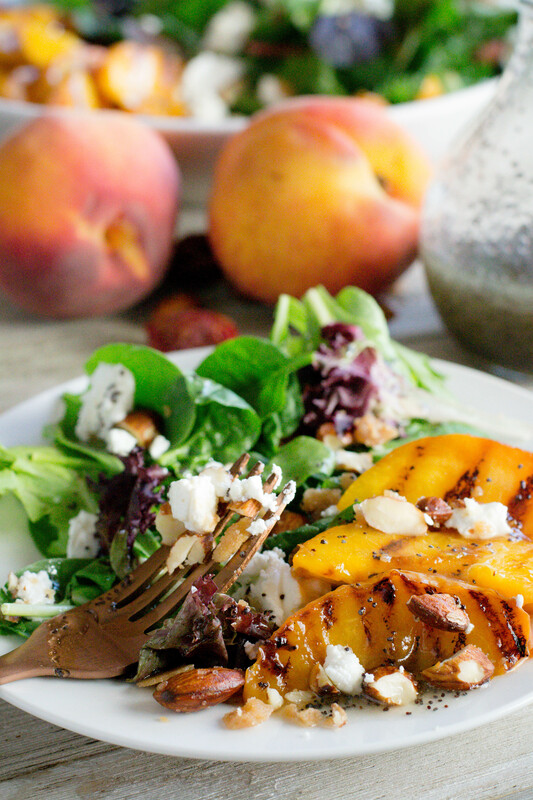 Grilled Peach Goat Cheese Salad with Candied Almonds is a recipe that could not wait! In the Midwest, really good peaches have a short window of time to enjoy….now is that time! Up until I started writing What the Forks for Dinner? I really was not a fan of fruit on a lettuce salad. It seemed wrong??? Oh contraire….I was wrong! Fruit on salad is delicious!! Here are just a few of my salad recipes that have fruit. I need to revisit a couple of these. So, when peaches are in season, my go-to with them is a Peach Cobbler. I have a tried and true recipe that is a peach of a dessert. In looking back, I realized that I have not made this recipe for the blog……I must rectify this very soon!! For now though, lets talk about this salad. This was so freaking good!. Truth be told, grilled peaches are super simple to make and grilling brings out their juiciness and intensifies their sweetness. 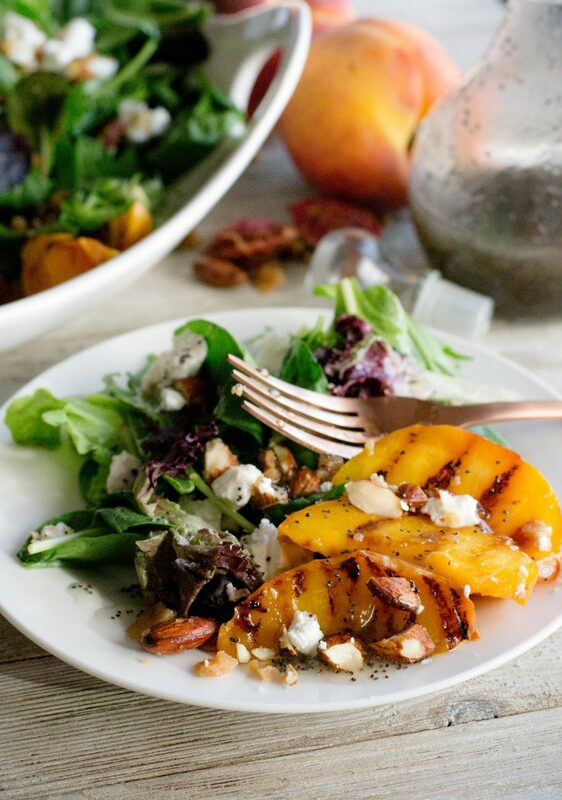 A simple yet stunning presentation…thanks to the grilled peaches, this salad is ready in a flash and tastes like a million bucks. 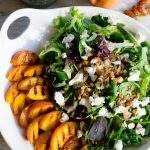 Spring mix piled on a serving platter, topped with crumbled goat cheese, candied almonds, and the beautiful grilled peaches….then dressed with a Poppyseed Vinaigrette. Candied any kind of nuts are easy. A bit of butter, sugar, and the nut of your choice. A quick swirl in a small skillet, a few minutes to cool, and you have a sweet, crunchy topping for…..well anything you like. 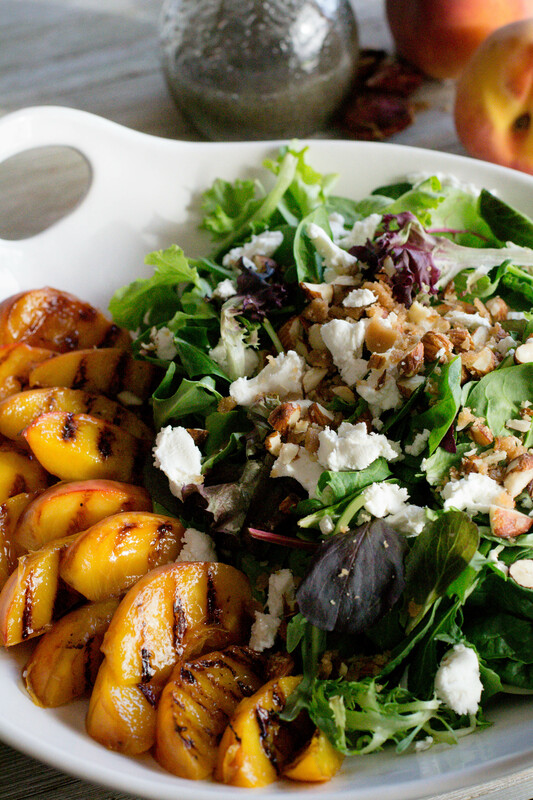 In this case Grilled Peach Goat Cheese Salad with Candied Almonds. 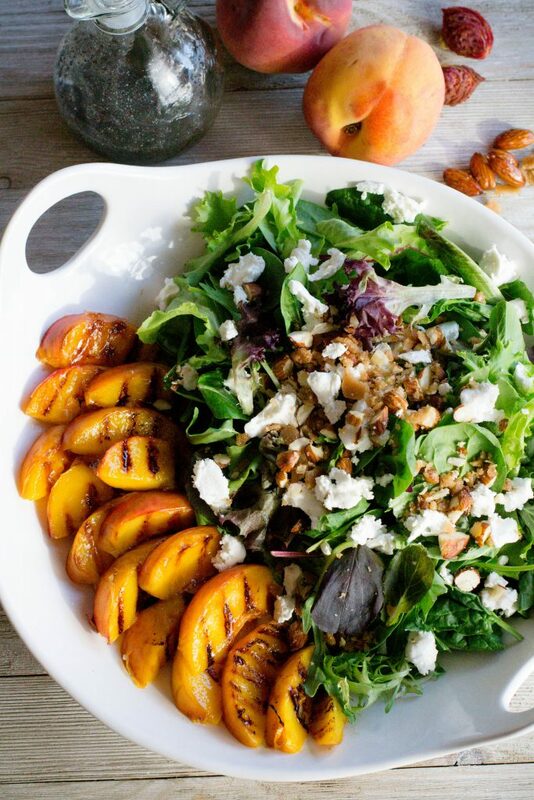 Salads with fruit need a slightly sweet dressing in my opinion. I remember as a kid a fruit salad (all fruit) that my Mom used to make that had a sweet poppyseed dressing….I loved it. This is not exactly like hers, but pretty darn close. Oil, vinegar, honey, and a touch of sugar for extra sweetness are whisked, shaken, or blended …….. I chose blended……..to make the perfect dressing to top the salad. 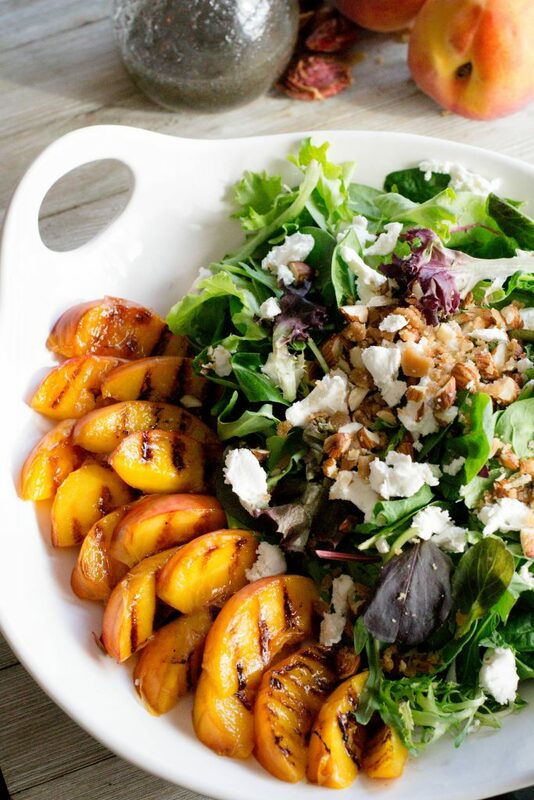 It’s Saturday….get to your local Farmers Market, grocery store, or roadside stand for some fresh sweet juicy peaches and whip up a Grilled Peach Goat Cheese Salad with Candied Almonds! Cut each peach in half and remove the pit. Slice Peach halves into 6 slices. Spray slices with unstuck cooking spray (I use coconut oil). Preheat grill or grill pan to medium (you can use either) Grill peaches slices 2-3 minutes, until they have nice grill marks and are just turning soft. Remove to a plate and set aside. On a large serving platter arrange spring mix. Top with crumbled goat cheese and candied almonds. 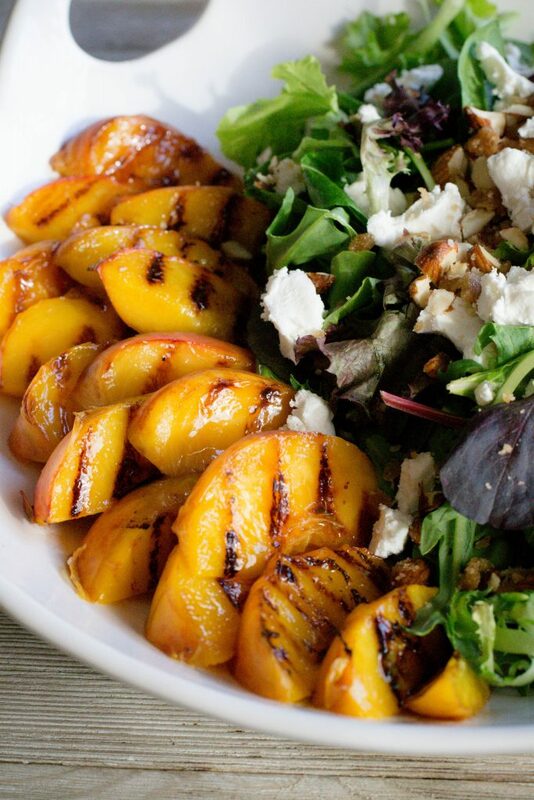 Arrange reserved grilled peaches on platter (I put mine on along the side). Top with Poppyseed Vinaigrette and serve. Place all ingredients in a small skillet over medium high heat. Cook stirring frequently until the butter has melted, the sugars are dissolved and the almonds are coated.Spread on parchment paper to cool. Combine all ingredients in a container and shake until combined. Store in refrigerator.